I've had so many casual posts lately that I made an extra effort to get one a bit more formal out for a change. It is getting so dark that taking pictures is starting to be a challenging task. Anyway, here we go. Charcoal pinstripe suit with a semi-structured shoulder, sky blue shirt with a spread collar (this is one of those looks that would have benefitted from double cuffs), navy blue E. Marinella foulard silk tie, white/navy paisley silk pocket square and black semi brogues. The scarf is a thin grey wool scarf with a herringbone pattern. I like this one a lot, and the jacket fits better now that I had it let out a bit from the chest and along the waist. I'll try to take a fit pic next time I have it on. 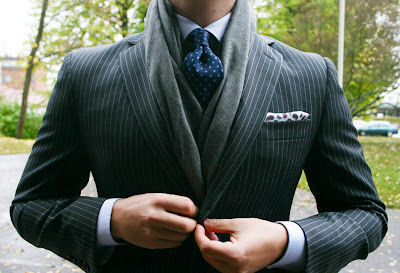 The way the shoulders look in the below picture is due to the scarf being underneath the jacket. One of my favorite features of this combination is the shoes, love the beautiful sleek shape, which looks all the more stunning when the shoes have a good polish. However, wearing this made me think of two things I need. 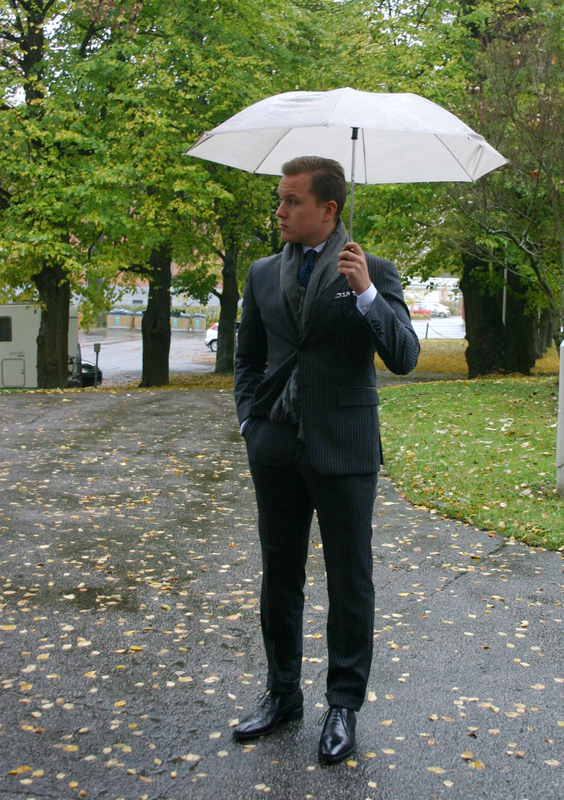 First, a good umbrella, and second, more navy ties. More stuff coming soon, and remember to like on FB to get notifications on new posts. What an awesome look, I especially love the tie and scarf. Who makes the scarf, the texture is really awesome! Thank you very much! The scarf is from H&M actually, just a few euros. Perfect for fall as it isn't too hot. Love the outfit,very bossy! You repeteadly said people in your area and workplace dress more casually("sartorial wasteland" if I recall corectly, very funny expression btw), don't they tease you for beeing much more elegant and classy and make you feel overdressed from time to time? I'm lucky in the way that I don't think people really mind/care and are used to the way I dress. I have to say this suit doesn't really get that much wear at the moment, apart from the occasional Monday. Just when I feel like pulling myself out of the grey and have a boost of sharpness in the morning, if you know what I mean. Anyway, nice to hear your comments again, thanks.